Hoke's Mad Magicians: Roy Round"Tree"--Will He Wear The #1 Jersey? Roy Round"Tree"--Will He Wear The #1 Jersey? Roy Roundtree has become something of an enigma at Michigan. We never know what kind of player to expect. In 2010, he showed maturity and poise beyond his years on his way to a 72 catch, 955 yard, 7 TD season. Last year, in 2011, he regressed into an almost afterthought with 19 catches. 355 yards. 2 TDs. After 2010, there were some widespread rumors that "Tree" might earn the coveted #1 jersey. We all know what that means. Anthony Carter, Braylon Edwards, Derrick Alexander, David Terrell, and Paul Goebel all earned the right to wear it. The idea behind the jersey is not too complicated. It's not an official declaration of the athletic department and coaching staff, but it's supposed to symbolize the receiver has become the "best" on the team both on and off the field. It doesn't separate that player from the rest of the team, or at least isn't supposed to separate them, but it does make them elite. That player needs to earn the jersey, and last season, Roundtree did far from it. Every receiver has good games and bad. Against Illinois in 2010, Roundtree had 246 receiving yards. That was one of those games during the RichRod era that left many Michigan fans in disbelief. I caught some of the scoring in the end on the radio, shaking my head in disbelief. While we could score better than we could with Threet or Sheridan, our defense was beyond porous. Racking up 246 receiving yards was great for Roundtree personally, but when you take the rest of the game into account, it's really not that significant. 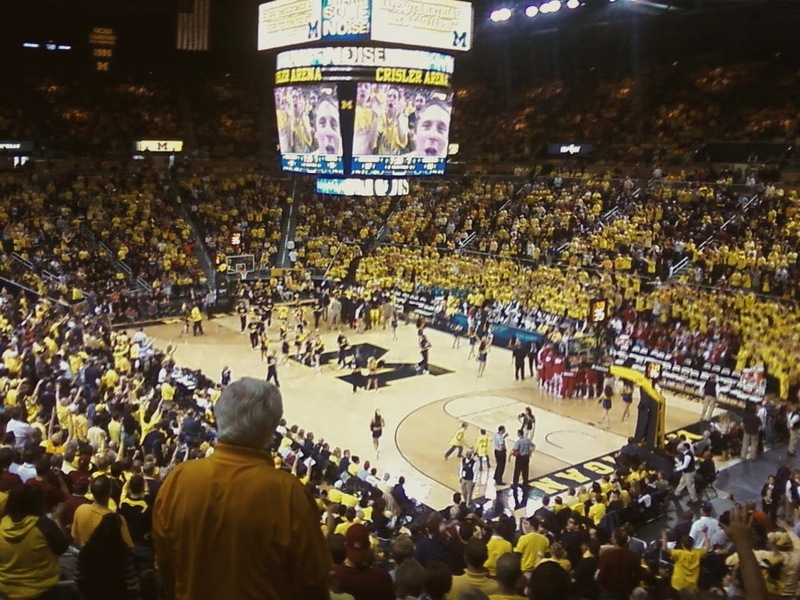 So where does Michigan turn to in 2012? Gone will be Koger and Hemingway. The only other starting option next to Roundtree is speedy Jeremy Gallon. Gallon can make fantastic catches, but with his size he can only do so much. I've heard there might be some packages involving Devin Gardner as a wide receiver this season. Darryl Stonum has been dismissed from the team, and while this decision hurt our depth; we all understand why Brady Hoke had to do it. There is some new recruiting blood such as Jehu Chesson that can take some heat off the incumbent players, but we never know how that could turn out. Bottom line, I expect a lot from Roundtree this season. Anyone who knows him or follows him on Twitter can tell he's a great guy. I know he can step up and be that receiver who can stretch out the opposing secondary. Hoke and Borges will probably leaning heavier on the power run offense this season with a bigger offensive line intact. Will he earn the number 1? I have my doubts. However, I also have high expectations and I expect nothing less from "Tree." I like Roy Roundtree but noway does he deserve the honor of wearing the #1 jersey. I would keep it boxed up yet another year. Luis! Wow someone else has the same opinion as I do! Not to bash Roundtree at all...but look at the TYPE of receivers that have wore #1: Pro-style, great hands, strong, and DEEP THREAT. Roundtree does NOT fit the bill of that prototype..lets get a kid in here that fits the mold and not tarnish the tradition. Again its my opinion, I just hold a high expectation. Mike, I really like Roy Roundtree and would have no argument if he would had another 1,000 plus season last season, but he didn't. Of course it was not all Roundtree's fault, but he still did not perform all that well when he got his opportunity to shine. The #1 jersey needs to go to an "elite" WR who is great on and off the field just like Anthony Carter, Derrick Alexander, David Terrell and Braylon Edwards were. All four former #1 were All American's. There is no need to give someone the #1 jersey just because it is not being used. If Roy earns it this during spring and fall ball he better be ready to carry on the great tradition the #1 jersey is all about. Go Blue! Guys I agree with what you are saying in part, Roy didn't do much in 2011. However even if he does have another sub-par season he will surpass Derrick Alexander for all time receiving yards and if he can pull together a decent season and with 600 total receiving yards he will finish 4th all-time with only Braylon, AC and Amani Toomer ahead of him. It might be time to dust off ole #1 to motivate him to be that big play WR. 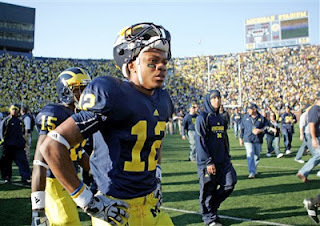 Go Blue 2012, you also have to remember Alexander was much more than a WR. Derrick also had over 1,000 yards in return yardage (one of six Wolverines to do so). Derrick is one of just two players in school history with four punt returns for touchdowns and was the first Wolverine to return punts for tds in consecutive games. Alexander is one of 15 Michigan players and one of only five Wolverine receivers to amass over 3,000 career all-purpose yards. Roy Roundtree is a good player and I like him a lot, but the #1 jersey means more than just having one good year. The #1 jersey is not about motivating a player it is about awarding a player for their success on and off the field. Go Blue.